the benefits of utilising light steel framing as an environmentally friendly construction method. Silverline Group has earned the reputation of expert in the field of light steel frame construction. We offer the full spectrum of construction services and have completed a wide variety of building projects ‐ from residential to commercial, industrial and institutional developments. 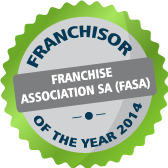 Our stable infrastructure, advanced technology, network of professionals and diligent business management allowed us to expand our international footprint via our Construction Franchises – earning us the prestigious award of Franchisor of the Year 2014. We are also the proud winners of the South African Steel Award (2014 — Light Steel Frame Category) and the Sanlam Emerging Business Entrepreneur Award (2013).